SINGAPORE - Picturesque Punggol will form the backdrop of this year's National Day Message, Prime Minister Lee Hsien Loong revealed on Facebook on Sunday (Aug 7). 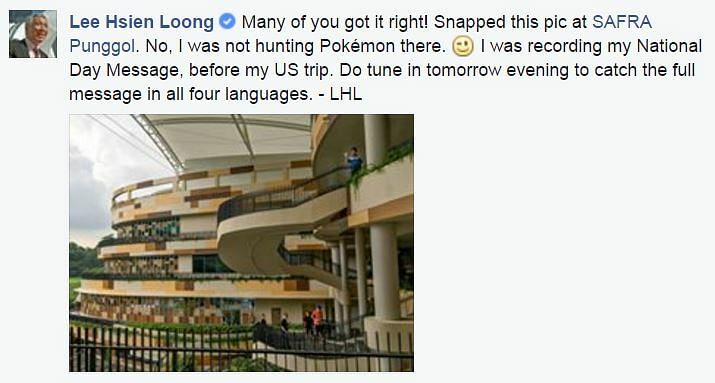 In his post, Mr Lee said he is always on the lookout for a good venue to record his message, and settled on the recently opened Safra Punggol. Last year's Golden Jubilee message was recorded at the historic Victoria Theatre and Concert Hall. On the choice of this year's venue, he wrote: "There, you can see and experience the Singapore that we are building together in the next 50 years - the beautiful Punggol Waterway, the new HDB homes, and the young families strolling or exercising along the park connector." Mr Lee also uploaded a behind-the-scenes photo of the recording, in which he is seen in a blue shirt . Earlier on Sunday, he had posted a photo of a flight of stairs and asked if anyone could guess where he was at. He subsequently revealed the location in the comments thread of the post, and joked that he was not there to hunt Pokemon, in a reference to the launch of popular mobile game Pokemon Go in Singapore on Saturday. The National Day Message will be broadcast on Monday (Aug 8). Viewers can tune into the English version on Channel NewsAsia at 6.45pm, the Malay version at 8.30pm on Suria, the Chinese version on Channel 8 at 8.45pm and the Tamil one on Vasantham at 9pm. All four versions will be shared on the Prime Minister's Office's YouTube channel after their respective telecasts.